Get ready for an epic journey to defend your kingdom against hordes of orcs, monsters, evil wizards and other nasty fiends with a vast arsenal of towers, heroes, Knight and spells at your command! The Vikings are known for their ambitions to invade lands, but now they are the ones who must defend themselves against invaders. The invaders, also known as the force of evils suddenly arise. Where do they come from? No one knows. They attack people and destroy the Kingdom. The Kingdom and its alliances struggle to survive. Lives, families, separation… are meaningless to these monsters. Fields rot. Woods burn. The common folks suffer. Devastation is everywhere! The Kingdoms have but one choice: to defend! Are you ready to fight? Lead your troops and all heroes through an epic adventure as you defend exotic lands from evil monsters with towers, heroes, and magic to help you crush your foes to a pulp. 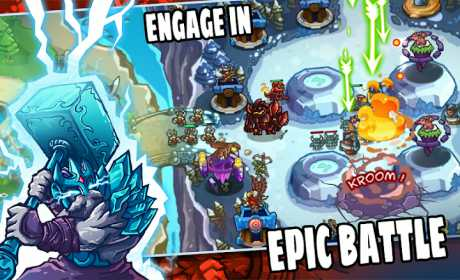 Rain fire upon your enemies, command your troops, summon reinforcements, recruit warriors and face legendary monsters on a quest to save the Kingdom from the force of darkness! Deploy rapid-fire archers! Carve walls on the map with magic beams! Fire roaring cannons! Summon allies! Kingdom Defense offers variety and challenge. 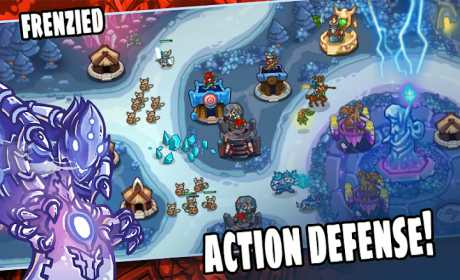 Kingdom Defense – Bigger Tower Defense game than ever before. This TD game is a whole new level of the furiously fast, enchantingly charming gameplay and strategy! Kingdom Defense takes place in a fantasy realm of beauty and nature. Adventure through lush forests, gold land, snow-covered mountains, and epic desert as you face off against army of slimes, goblins, skeletons, werewolves, orcs and other fearsome creatures. Defend your kingdom from them! Engage in an epic battle to save the world with courageous heroes and ancient magic by your side! Kingdom Defense offer four basic towers: Archer Turret, Knight Barrack, Stone-Thrower and Magic Dragon. Each tower has its own function and strength, which is built to help defeating certain types of monster easier, but can be ineffective when it comes to other opponents. Towers can be upgraded up to the fourth level. When upgraded, they gain more fire power and range to help you win the battle! On top of that, towers can also be enhanced using stars earned per battle. With this new surge of power, you can customize each of them with various special effects and potential such as boosting power, reducing skill cool-down… If you find out that the same strategy cannot be carried to the next battle, you can reset the skill tree to mold it to your heart’s content. Collect magic items such as meteor strike, frost gem, healing ward or Gold box! They will greatly help you win your battles! One very special feature Kingdom Defense can offer is the hero system. We aim to create a perfect combination of strategy and Role-playing game! In addition to towers and magic items, you can summon heroes and command them to help you fight off enemies. 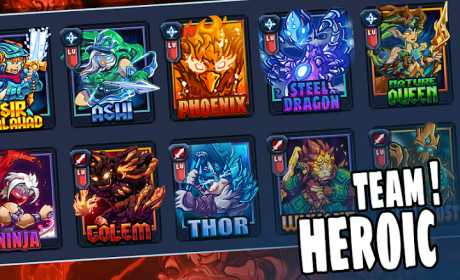 A variety of hero can be chosen to take to battle: Galahad the Indomitable Warrior, Ashi the Hawkeye, Wukong, Shaman, Golem… Each of them is special on their own. Choose wisely and you’ll be the winner!